Knowing Your Numbers is an important step to Raising Your Profit! At Zonmaster we’re always looking for ways to improve our services to you so that you can get a better handle on your Amazon business. Whether you’re a big or small seller we think you should have access to the same kind of great tools. As any business person will tell you, know where you’re making money – or loosing money – is vital. So we’re working on giving you better financial tools. 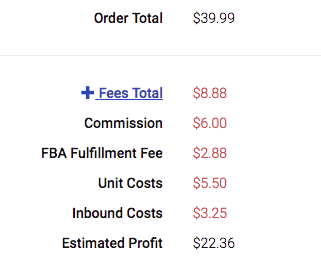 The first step is to show you true profit on your orders. On your orders now you should see additional information that shows you fees. 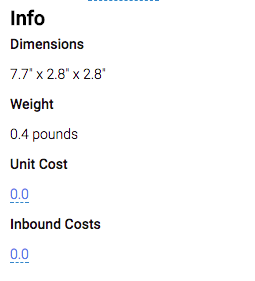 As you can see, there is a space for Unit Costs and Inbound Costs. This information can only come from you, the seller. So, if you zip over to your items you can now see a space to enter that info. (For fun we also show some additional info about the item if it is FBA). 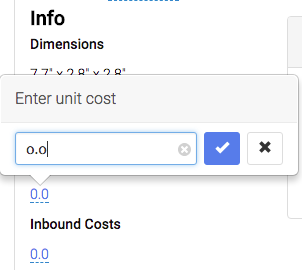 Clicking on either the Unit or Inbound cost value will bring up a popup. Just enter the value – don’t enter a currency symbol. With that input, if you go back to your orders you’ll see those values populated. We’ll be rolling out a bulk upload tool so you can just send us a CSV file with SKU, Unit Cost and Inbound Cost. IMPORTANT: This feature is still in development so some aspects may change. If you use this and experience any issues please let us know. Your feedback is the only way we can improve! Than is just perfect feature. 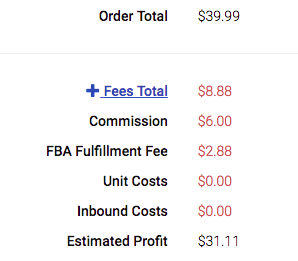 Where can I check profit for whole sales for a month for example? ?